NASA’s New Horizons mission team has released a video (shown below) simulating a landing on Pluto’s surface; it is made up of over 100 images taken by the spacecraft during its July 14, 2015, flyby of the dwarf planet. Low-resolution images taken by the spacecraft’s Ralph / Multispectral Visible Imaging Camera (MVIC) color camera were superimposed on high-resolution panchromatic (greyscale) images captured by its Long Range Reconnaissance Imager (LORRI) to create the video. Created using images captured during the last six weeks of approach, the color video begins with a distant view of Pluto and its largest moon, Charon. Viewers can see Pluto and Charon grow larger as they would during a real approach, eventually arriving above the chosen landing site at the shore of Sputnik Planitia, the left side of Pluto’s iconic ‘heart’ feature. A similar black-and-white video was released by the mission team last year. At closest approach, New Horizons came within 7,800 miles (12,550 kilometers) of Pluto’s surface, so the video concludes at a position above Sputnik Planitia, showing only a limited amount of surface detail. “To create a movie that makes viewers feel as if they’re diving into Pluto, mission scientists had to interpolate some of the panchromatic (black and white) frames based on what they know Pluto looks like to make it as smooth and seamless as possible. Low-resolution color from the Ralph color camera aboard New Horizons was then draped over the frames to give the best available, actual color simulation of what it would look like to descend from high altitude to Pluto’s surface,” mission scientists wrote in a NASA statement. 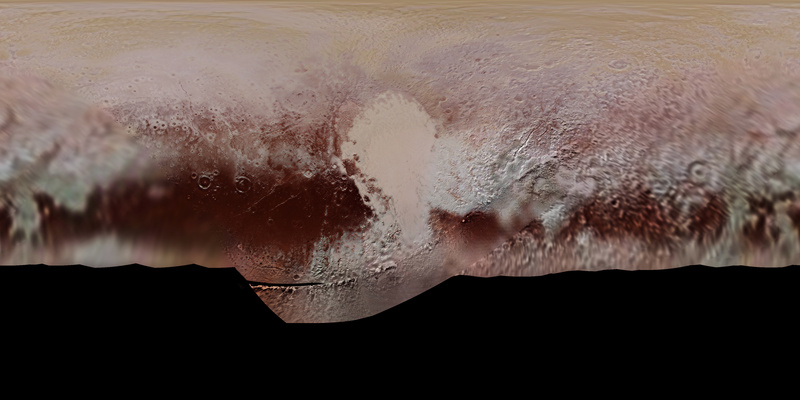 Also released was a detailed color map (shown above) of Pluto created with images taken using three separate color filters. Sputnik Planitia is located at the map’s center. The dark regions on either side of Sputnik Planitia, seen at the bottom of the map, are actually at Pluto’s equator. To announce the release of the video and map, as well as discuss New Horizons’ next destination, members of the mission team recently held a public webinar using Facebook Live. Those who missed the presentation can watch a recording online. Mission team members who took part in the webinar include Jim Green, director of NASA’s Planetary Science Division; Alan Stern, mission principal investigator; Glen Fountain, project manager; Kelsi Singer, mission co-investigator; and Helene Winters, mission project manager. In addition to discussing New Horizons’ next target, Kuiper Belt Object 2014 MU69, the participants also answered questions submitted by the public via social media. On January 26, the spacecraft began taking distance images of dwarf planets Haumea, Makemake, Eris, Quaoar, and Ixion, as well as KBOs 2002 MS4, 2011 HJ3, and 2014 MU69, automatically setting a record for the closest images of them taken by a spacecraft. 2014 MU69 is located approximately one billion miles beyond Pluto. Thirty miles wide, it is about 10 times larger and 1,000 times more massive than the average comet, but only one percent Pluto’s size and one-ten-thousandth of its mass. New Horizons will fly by MU69 on January 1, 2019. Both the images and data from the Pluto flyby continue to amaze viewers and inspire new studies. 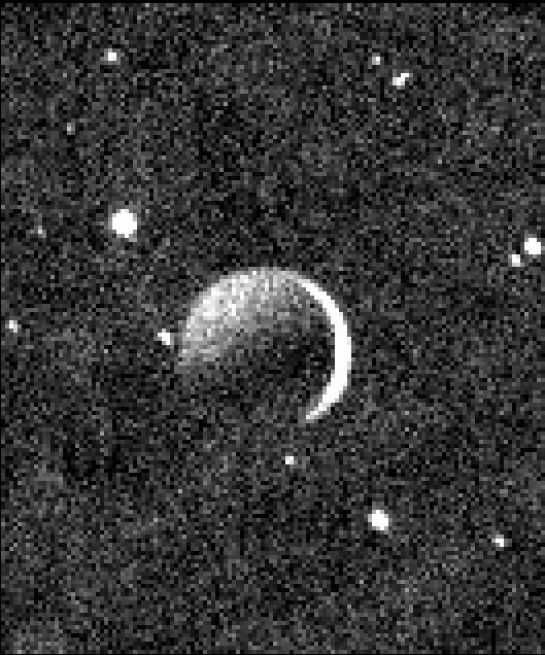 One photo (shown right), dubbed Charon in ‘Plutoshine’, portrays a crescent Charon against a field of background stars. Faint, reflected light from Pluto illuminates the rest of the Charon’s night side, the same way Earthshine often illuminates the night side of Earth’s moon when it is in its crescent phase. The image was taken by the Ralph/MVIC instrument at 100,000 miles (160,000 kilometers) from Pluto on July 15, 2016. Charon is also the focus of a new study conducted by a team of researchers who, using New Horizons’ data, determined that the large moon once had experienced plate tectonics similar to those that take place on Earth but made of ice. Long ago, Charon’s freezing core of ice expanded, cracking its crust, noted a research team led by Ross Beyer. Fissures on Charon’s surface appear similar to those in rift valleys or seafloors on Earth. Surface blocks surrounded by faults of different sizes known as graben and scarps show where land masses moved vertically in relation to one another. However, tectonics on Charon did not build mountains via collisions with one another, as happened on Earth. “On Charon, we saw only extensional features, as if the only thing we are seeing is pieces of crust moving away from each other,” Beyer said. Based on these findings, Beyer and his team suspect Charon once had a liquid mantle underneath its water-ice crust. When the ice froze and subsequently expanded, the crust cracked. Charon’s density suggests it has a rocky core although that core makes up only a small percent of Charon’s mass. Like Earth’s moon, Charon is presumed to have formed when a large KBO impacted proto-Pluto. Charon retains some heat produced by that impact, with additional heat generated by radioactive decay of rock in its core. Those heat sources, along with tidal forces from Pluto and ammonia on Charon’s surface acting as an anti-freeze and thereby lowering the freezing point of its water, could have sustained a subsurface ocean within the large moon. Because Charon is small, its internal heat likely radiated away in just a few million years, causing its mantle to freeze. This increased Charon’s volume and further fractured its crust. From Charon’s high number of craters, scientists know that its moon has been geologically dead for as long as four billion years, confirming its mantle froze early in Charon’s life. The team’s findings will be published in an upcoming edition of the journal Icarus.